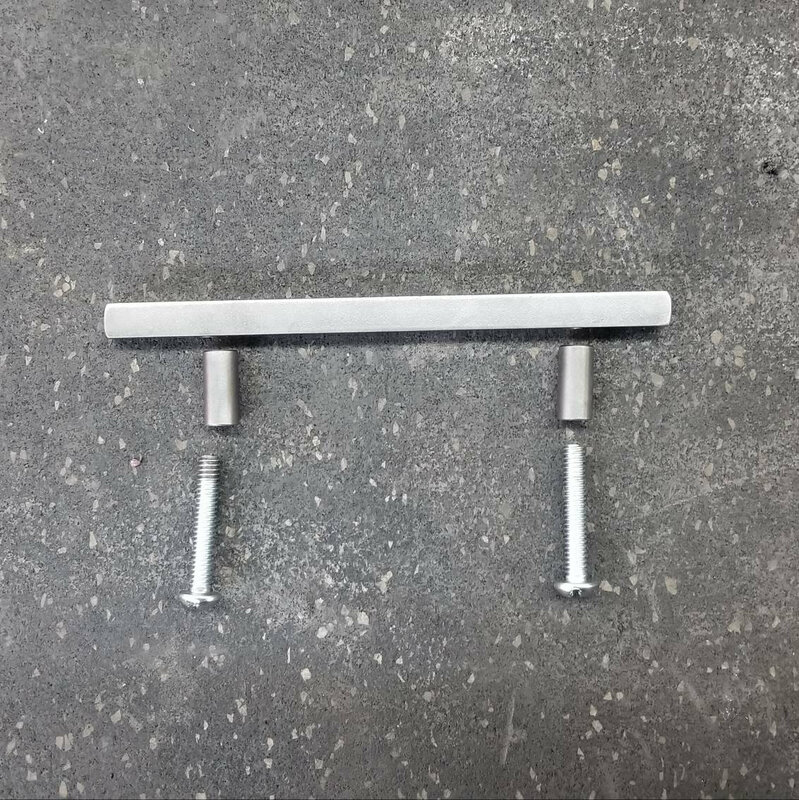 Modular Series Cabinet door/drawer pull - 3/8" Contemporary Steel - 4" - 16"
These are very similar to our Large Contemporary Cabinet pulls - with a more minimalist flair, better versatility and lower price point. 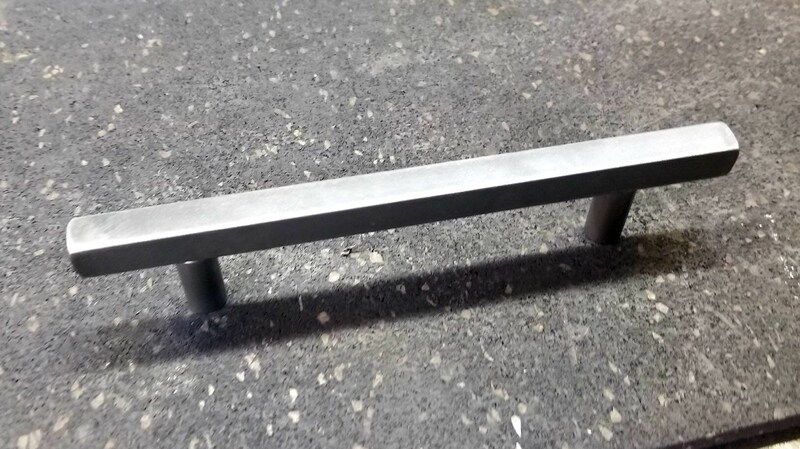 These cabinet pulls are made of mild steel rod and hot-rolled bar stock. These are handmade, to order, one at a time in our machine shop. As such, there may be minor differences between individual pieces. First, I cut the pulls to length, dress the ends with gentle chamfered edges, and drill/thread the screw holes. The posts are made from 3/8", 1/4" solid stock, bored, faced and cut to length on my fully manual Weiler production lathe. The pulls are finely sanded, and everything receives a generous coat of clear. Available painted (flat black is most common) for an extra charge - ask if thats what you're looking for and we'll get you set up. The smaller size measures approx. 1/4" square, and the larger size measures approx. 3/8" square. Other sizes of stock will be added when I receive them - if youve got any special requests, please drop me a line and we'll make it happen. In standard configuration mounting holes are spaced 1" from the ends and threaded to SAE 1/4"-20. - appropriate length screws are included based on your order. 1/4" size will get #10-32 screws. 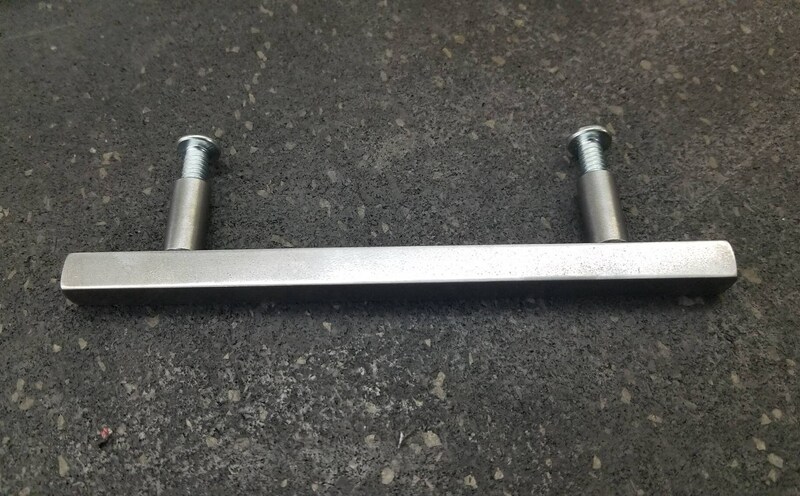 The 1/4" screws are beefier than what is generally included with cabinet handles, which makes them an excellent option for commercial settings or other thick drawer front type configurations. They'll work 100% in standard applications as well. Standoffs are made of 1/4" or 3/8" mild steel. Currently, two stand-off length options are available - 1/2", 3/4" and 7/8". Please note: This is for one pull. This is called the modular series because as time goes on I will be adding different choices for standoffs as well as pulls and everything will be mix-and-match.